I love lighting candles throughout the house, especially when the sun goes down. Now I’m finding I can add healthy benefits for body, mind, and soul every time I light a candle by making my own using essential oils. I enjoy my diffuser and diffuser jewelry throughout the day, but in the evening, I love my candles. It creates such a peaceful vibe. If you’ve been using aromatherapy, you already know how wonderful each essential oil is with its own unique properties. Candles give you another way to enjoy the many benefits, as well as the fragrance and the peaceful atmosphere they produce. 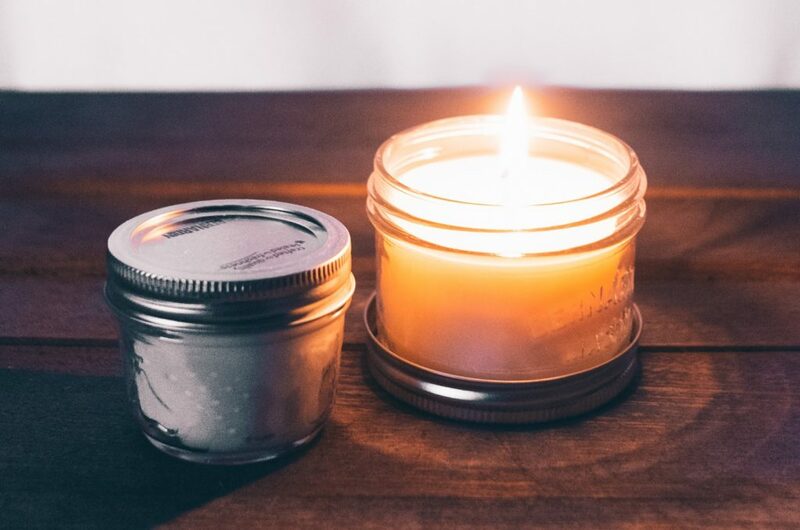 Scented candles are great for meditation, helping you to keep your focus, especially when you make candles with essential oils such as lemon, lemongrass, bergamot, grapefruit or orange, which help get rid of distractions. Another one that’s nice for meditation because of its grounding properties is a frankincense candle. One of my favorite morning candles to uplift my mood and get things off to a positive start is orange. It’s both refreshing and invigorating. In my bedroom, I light up a lavender candle before bedtime to help me sleep. Like using essential oils in a diffuser or topically, candles with certain oils are anti-bacterial, antioxidant, antimicrobial and antiviral, helping you with many physical issues. You can use any of your favorite essential oils to make candles. It’s easy and doesn’t cost a lot. Use soy wax, which can be melted in a microwave or double boiler, or beeswax, which you’ll need to melt in a double-boiler. Skip the paraffin wax—it’s a byproduct of petroleum and releases carcinogenic soot when burned. The toxic chemicals benzene and toluene are released when this wax is heated, the same as those found in diesel fumes. This can cause respiratory problems or aggravate existing conditions such as asthma, lung, or heart problems. One reason to make your own candles is to have a healthier environment, so stay away from paraffin wax. Using a double boiler, melt the wax. Attach the wick in the center of the container. You can use superglue or dip the metal tab of the wick into the melted wax. Once completely melted, add essential oils to the wax. The wax may have specific instructions on how much to use. If not, try 100 drops of essential oil for each pound of wax. This is something you may want to experiment with to get it just the way you like. Let the mixture cool for a couple of minutes before pouring it into the container. Lightly hold the wick as you do so. While it cools, secure the wick by placing a pencil or chopstick on top of the jar and lightly wrapping the top of the wick around it. Once cooled, trim the wick and enjoy! Use whatever essential oils you like, but here are a few ideas for your aromatherapy candles. Destress and sleep tight with a combination of three drops each of lavender and ylang ylang and one drop of rose essential oil. Lemon brings a fresh, clean aroma to your home and can also keep pests away. Here’s another one for insect control—a mixture of 10 drops of lavender essential oil and five drops each of lemongrass and geranium essential oil. Stressed? Headache? Light a clary sage candle. Your cinnamon candle can refresh your mind and boost your concentration. Nasal congestion, flu, headache? Mix five drops each of peppermint and star anise, along with two drops of clary sage. For holiday candles (great gift idea), use juniper berry essential oil for an evergreen-scented candle. The possibilities are endless. Try a few of these ideas, as well as some of your own. You’ll have the best smelling home with aromatherapy candles that not only smell good, but offer benefits to you and your family’s health. Love the essential oils. Great for sleep, calming, and concentration.